My boys think of toast as something to eat at breakfast but to me toast has endless possibilities. My favorite way to think of toast is as an open-faced sandwich at lunch with countless topping combinations. 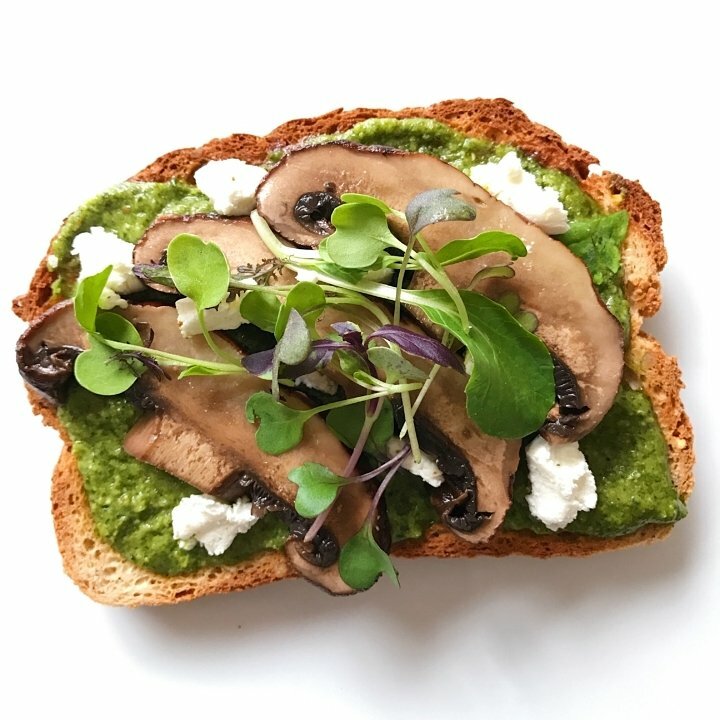 Today is roasted portobello mushrooms, arugula-pumpkin seed pesto, goat cheese and micro greens on Canyon Bakehouse Heritage Style Whole Grain bread. Such a great flavor combo! As an aside, we are loving the Canyon Bakehouse New Heritage Style larger sandwich bread! All the more space for toppings! This savory combo makes a delicious light lunch or snack. The pesto recipe is adapted from Urban Kitchen Apothecary. Gently toss portobello in olive oil and lay flat on a baking sheet. Roast at 400 degrees for approximately 15 minutes or until tender. I usually roast several at once and save the extra for another use. Blend all the ingredients together using a blender or food processor. Generously spread pesto on a slice of your favorite toast. Top with goat cheese and micro greens and Enjoy!